Hi Albert! the gold antique wedding ring found while treasure hunting, features simple but beautiful three-leafed Shamrock that appears encircling the band; the plant symbol that is based on clover. 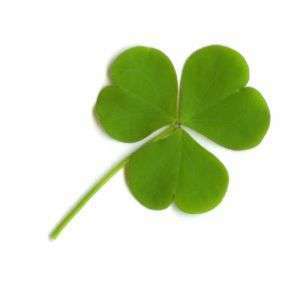 In legend, it's believed that St. Patrick once plucked a leaf of it for use in illustrating the doctrine of the trinity. The shamrock has been revered as sacred, from the time of the Druids. It grew with such vitality that, in the meaning of flowers, it came to represent life itself. Medieval love poetry continued this association where young couples would meet or make love in clover. The symbolic meaning of flowers was developed in Victoria England, and transferred onto Victorian fashions and jewelry. Made during the Victorian era (1837 - 1901) in the United States, it is engraved in cursive, with the date 1872, just seven years after the civil war ended. It epitomized the mood of the time and imbued with the hopes and dreams, of a better future..
the Act of Union of 1803 that incorporated Ireland into British polity, useless in easing the impoverishment of the Irish people. Plus, religious prejudice of the Protestant Masters to the Catholic Irish, Irish people had to emigrate to the United States for relief. Starving families, could not pay landlords and had no alternative but to leave the country in hope of a better future. Almost 3.5 million Irishmen entered the U.S. between 1820 and 188. Engraved in cursive/script, during America's golden age of penmanship. The period between 1850-1925 produced the most graceful forms of handwriting ever developed by Western Civilzation. Another interesting thing, concerns the karat, it being comprised of 18 karat gold. Despite it's age, it appears to be in good condition, doesn't seem to have suffered much punishment at all. Many high carat antique gold rings have been worn to a dangerous thinness. The ring being buried, is noteworthy. Some people, bury their rings, so that no other person will ever wear them. We see you've solved the maker's mark. The purity mark appears within this US trademark. The value of this antique wedding ring is the amount the buyer is willing to pay. Return to 18k in Shield.